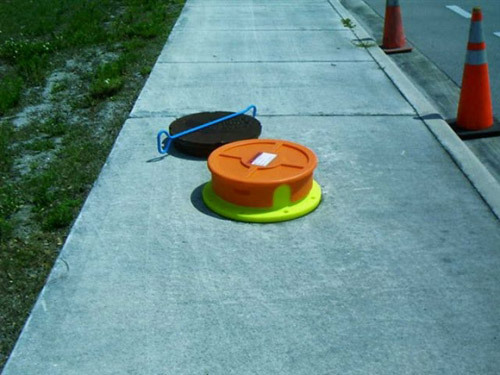 Manhole guards are a versatile, easy to use, durable and lightweight solution for preventing accidental slips or falls. Protect workers and the public with these high visible devices to provide safety around open manholes. Either purchase as a simple way to easily prevent injury or accessorize with hose or cable guides, lighting kits, or Bypass Kits. Lower liability and risk with manhole guards without taking up a lot of space in your work truck between jobs. Custom designs can be accommodated, call for pricing. Some custom features include: colors (standard color is safety orange), sizes (standard sizes are 24” and 30”), even company or municipality logos. Inquiries for this product range from various utilities like telephone, gas, water, electric, cable TV, or natural gas. Also, the guards with optional cable roller guides are a great companion item to sewer pipeline camera inspection systems. Hose guides can help better manage feeding of sewer jetter hoses. 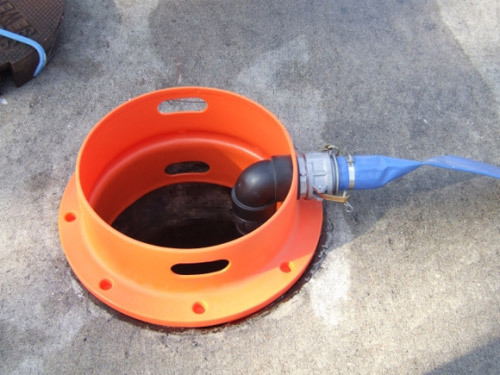 This device has become a standard for all open manholes. Cost effective, lower cost compared to other more complicated metal rail systems. 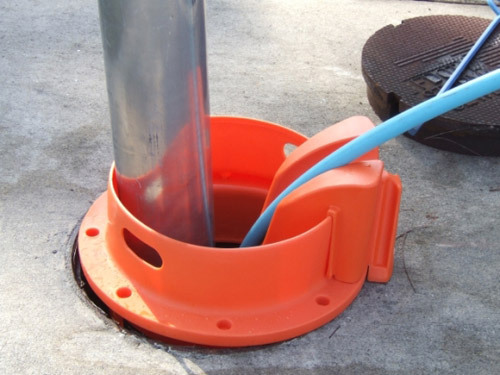 Promotes safety, highly visible safety orange alerts those in area the manhole is open. Minimizes liability, shows your customers you are working smart and safe. Prevents slips and falls, easily seen with a high side wall and bright color. Protects workers and public, easily installed and can be used with safety cones. Reduces injury time loss, as a result of lower slips and falls. Is a visual warning, guard open manholes reduce time-loss due to injury. Prevents loss of tools, eliminates possibility of items falling down lines. Choose from two standard sizes and accessorize as needed for your application. Larger sizes available on request. Far less complicated to set up compared to rail systems for open manholes. A more cost-effective alternative as well, these safety devices have four grab handles for easy and fast install and pickup when done. Hose guide or roller guide available for sewer hose or cables. Optional Metal Battery Powered Light Kit Attaches to Lip of Guard. This Mini-Monitor fits in a smaller space and a smaller budget. These kits are available from .125" up to 1.00". Using high pressure to clean your sewer drain lines.